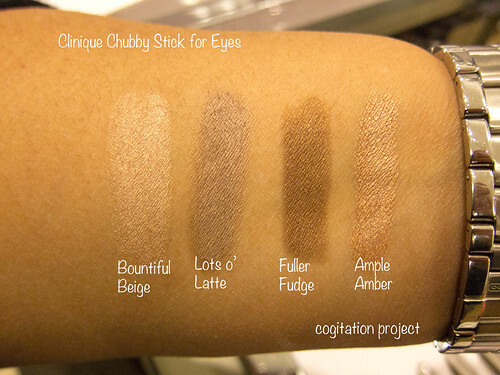 My trusted SA from Nordstrom at The Grove (Los Angeles, CA) alerted me that the Clinique Chubby Stick for Eyes has now arrived. 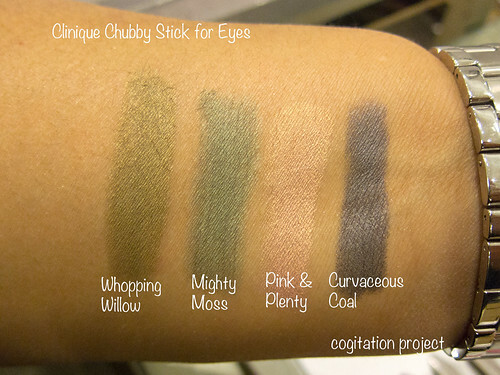 Here are pictures and swatches. I apologize in advance for the bad lighting. Hope this helps. It is love at first swatch for me (mostly). They are quite pigmented, some sheerer than most. Bountiful Beige, Pink & Plenty and Big Blue are quite sheer. I had to do several pass to make the colors pop. This could work depending on your use. This colors would work best as a highlight on brow bone and/or inner corner on my skin tone the best. And for that purpose I chose to purchase Bountiful Beige. I’m also thinking of using this as an illuminating base. One thing that I also noticed is that they apply smoothly, very creamy and even. No tugging or pulling at all. 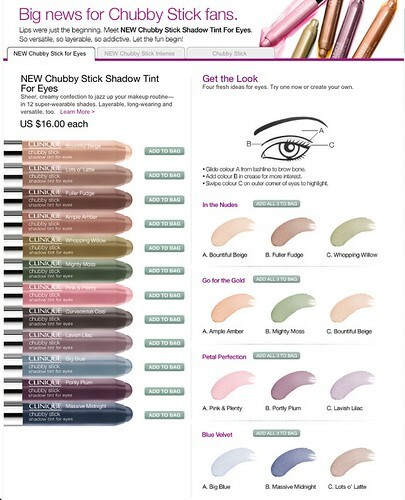 Here’s a screen grab from Clinique’s website showing some easy looks using the Chubby Stick for Eyes. 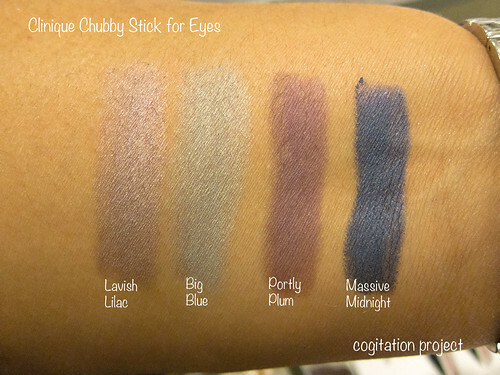 I got myself 6 chubby sticks and will be featuring them shortly. What do you think? I am over the moon excited to be road testing these chubbies as soon as possible. 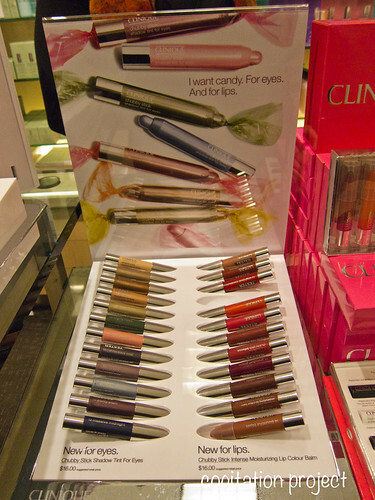 It is now available for US $16 at Clinique.com, Nordstroms, Macy’s and Neiman Marcus. these look really good! cant wait for those to get here! Hi! Thanks for dropping by. Where are you from? I’m from the Philippines! 🙂 I should check out the stores then! Oh my fellow Pinay 🙂 I guess they had an early release here. Advertised release date was supposed to be Feb. Summer is fast approaching and these should be able to stand to the humidity and heat. You’re welcome Sunny! I can’t believe how easy to use these sticks are. You can’t really overdo it. 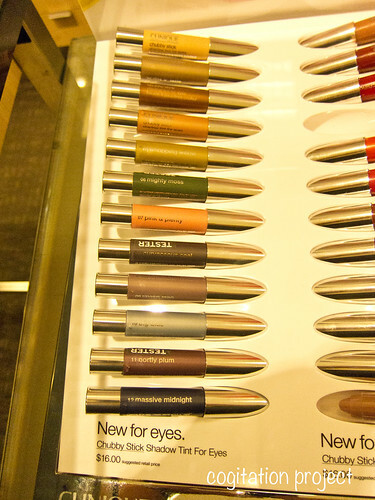 I hope they have more colors and matte options. Thanks for dropping by! I just discovered that my lids are oily. And it fared really well. But everybody’s chemistry is different. I hope you really get to play with them.